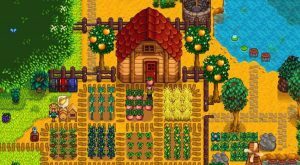 Stardew Valley is an indie farming simulator first released in 2016 that’s now available to play on most major platforms. You play as a character who has just inherited their late grandfather’s farm in Stardew Valley. You then start the game once you move and begin your life as a farmer in a quaint area called Pelican Town. You manage your energy, health, and time as you handle your farm, livestock, mining, crafting, and socializing with the various villagers. The town used to be vibrant and bustling, alongside the now-dilapidated community centre, but the ways have changed now that Joja Corporation has arrived. Joja Corp poses a threat to the community centre with its plans to convert the remnants of the community centre into a warehouse for their store, JojaMart. The market itself represents a divide amongst the villagers, since some villagers purchase their groceries at JojaMart, but in turn their patronage takes away from local businesses such as Pierre’s General Store. There are a vast variety of characters in game, with 12 characters available to romance and eventually marry. Once wed, they move in with your character and help out around the farm. There is also a chance to have children, but they cannot mature past the toddler stage at this time. Seemingly shallow at first look, Stardew Valley catches you off guard with the NPC (non-player character) backstories and dialogue. Pam, an alcoholic, offers her two cents on the world, with quips such as, “I was reading the newspaper this morning but then I got depressed. It’s a rotten world, kid. Keep your head screwed on right and you’ll make it through in one piece.” Talking to villagers daily and giving them gifts increases your relationship levels, leading to enhanced dialogue and unique cutscenes. Take Alex, for example; he is an athletic character who is initially superficial and arrogant. At a lower relationship level, he’ll propose dialogue to your character such as, “If you weren’t a girl I’d ask you to play catch.” (To which you can, of course, give him a piece of your mind.) However, as your relationship develops, he tells you his tragic backstory (spoiler ahead!) involving his abusive alcoholic father who left and his mother who passed away shortly thereafter, which is why he now lives with his grandparents in the valley. All the characters are amazingly developed with real world characteristics that make them both lovable and relatable. Stardew Valley also has a four-player cooperative multiplayer mode. This allows you and your friends to live on the same farm, with the ability to date and marry amongst each other. Oftentimes, the villagers will ask you to do quests that will either further your progress in the game or increase your relationship with them. Unlockable milestones exist in the game, but there is no definite end to each save file. I was skeptical at first about how much I could possibly enjoy a farming simulator (my gaming roots are in Halo and other first-person shooters). However, I now have 96 hours logged and I’m nowhere near tired of playing. Stardew Valley is a lot more than I bargained for and I would recommend anyone to play it for a casual good time.